عباسی, ساناز, چرم, مصطفی, عنایتی ضمیر, نعیمه, معتمدی, حسین. (1395). جداسازی و شناسایی باکتری‌های مقاوم به سرب و کادمیم و حذف این فلزات از پساب شهری. مجله آب و فاضلاب, 27(6), 59-68. ساناز عباسی; مصطفی چرم; نعیمه عنایتی ضمیر; حسین معتمدی. "جداسازی و شناسایی باکتری‌های مقاوم به سرب و کادمیم و حذف این فلزات از پساب شهری". مجله آب و فاضلاب, 27, 6, 1395, 59-68. عباسی, ساناز, چرم, مصطفی, عنایتی ضمیر, نعیمه, معتمدی, حسین. (1395). 'جداسازی و شناسایی باکتری‌های مقاوم به سرب و کادمیم و حذف این فلزات از پساب شهری', مجله آب و فاضلاب, 27(6), pp. 59-68. عباسی, ساناز, چرم, مصطفی, عنایتی ضمیر, نعیمه, معتمدی, حسین. جداسازی و شناسایی باکتری‌های مقاوم به سرب و کادمیم و حذف این فلزات از پساب شهری. مجله آب و فاضلاب, 1395; 27(6): 59-68. فلزات سنگین در بیشتر نقاط دنیا در فرم‌های فیزیکی و شیمیایی گوناگون و در غلظت‌های متفاوت به‌عنوان آلاینده محیط زیست، از طریق تخلیه پساب‌های متعدد ازجمله پساب‌های شهری و صنعتی، وارد محیط می‌شوند. امروزه استفاده از روش‌های بیولوژیکی در تصفیه و حذف فلزات سنگین از پساب‌ها مورد توجه زیادی قرار گرفته است. به این منظور در مطالعه حاضر باکتری‌هایی با مقاومت نسبی به فلزات سنگین کادمیم و سرب از پساب شهری جدا و خالص سازی شدند. باکتری‌های خالص‌سازی شده با استفاده از آزمون‌های بیوشیمیایی شناسایی و میزان حداقل غلظت بازدارنده آن‌ها تعیین شد. حداقل غلظت بازدارنده باکتری‌ها در غلظت‌های 25، 50، 75،100، 150 ، 300، 500 و 750 میلی‌گرم در لیتر سرب و کادمیم به‌دست آمد. سپس توانایی باکتری‌های برتر با جمعیت CFU/ml 108 به‌منظور حذف سرب و کادمیم از پساب شهری غنی شده با غلظت‌های 50، 100، 150 و 300 میلی‌گرم در لیتر سرب و کادمیم مورد بررسی قرار گرفت. باکتری‌های باسیلوس لاتروسپروس و یرسینیا سودوتوبرکولوسیس به‌عنوان باکتری‌های مقاوم از پساب شهری جداسازی و شناسایی شدند. حداقل غلظت بازدارنده سرب و کادمیم توسط باسیلوس لاتروسپروس و یرسینیا سودوتوبرکولوسیس به ترتیب 300 و 500 میلی‌گرم در لیتر و همچنین حداکثر درصد حذف فلز سرب از پساب غنی شده با 100 میلی‌گرم در لیتر سرب توسط باکتری‌های باسیلوس لاتروسپروس و یرسینیا سودوتوبرکولوسیس به ترتیب 0 6/50 و 7/45 درصد و در مورد کادمیم 18/36 و 41/21 درصد در پساب غنی شده با 100 میلی‌گرم در لیتر سرب و 150 میلی‌گرم در لیتر کادمیم به‌دست آمد. Municipal and industrial effluents continually release into the environment heavy metals of a variety of physical and chemical forms and at various concentrations. Biological treatment processes have attracted a growing attention for the removal of heavy metals from these effluents. For the purposes of the present study, bacteria that are relatively resistant to heavy metals, such as cadmium and lead, were isolated from municipal waste and purified. They were then subjected to biochemical tests for identification and their minimum inhibitory concentrations were determined. Bacterial minimum inhibitory concentrations were initially measured in flasks containing 25, 50, 75, 100, 150, 300, 500, and 700 ppm of lead and cadmium before superior bacteria at populations of 108 CFU/ml were evaluated in terms of their ability to remove lead and cadmium at concentrations of 50, 100, 150, and 300 ppm from enriched municipal wastewater. Base on the results, Bacillus laterosporous and Yersinia pseudotuberculosis were identified as the resistant bacteria and the minimum lead and cadmium inhibitory concentrations for these bacteria were determined to be 300 and 500 ppm, respectively. Moreover, Bacillus laterosporous and Yersinia pseudotuberculosis recorded maximum removal efficiencies of around 50.6% and 45.7%, respectively, with wastewater containing 100 mg/l of lead and 36.18% and 21.41% in the case of cadmium from wastewater enriched with 100 mg/l of lead and 150 mg/l of cadmium. 1. 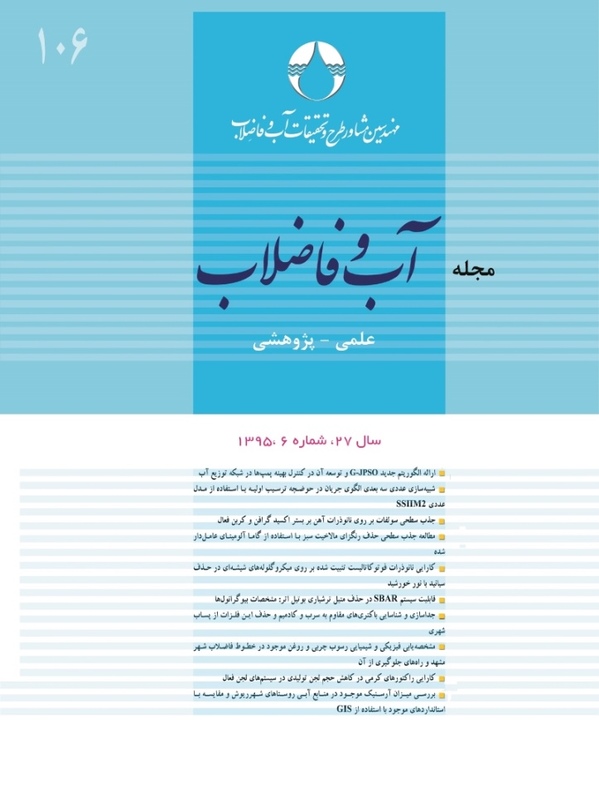 Masoudzadeh, N., Zakeri, F., Bagheri, T., Sharafi, H., Zahiri, H., Ahmadian, G.H., and Akbari Noghabi, K. (2011). “Biosorption of cadmium by Brevundimonas sp. ZF12 strain, a novel biosorbentisolated from hot-spring waters in high background radiation areas.” Journal of Hazardous Materials, 197, 190-199. 3. El-Gendy, A.S., Biswas, N., and Bewtra, J.K. (2005). “A floating aquatic system employing water hyacinth for municipal landfill leachate treatment: Effect of leachate characteristics on the plant growth.” Journal of Environmental Engineering and Science, 4(4), 227-240. 4. Zouboulis, A.I., Loukidou, M.X., and Matis, K.A. (2004). “Biosorption of toxic metal from aqueous solutions by bacteria strains isolated from metal-polluted soils.” Process Biochemistry, 39, 909-916. 5. Aksu Z., and Donmez, G. (2006). “Binary biosorption of cadmium (II) and nickel (II) onto dried Chlorella vulgaris: co-ion effect on mono-component isotherm parameters.” Process Biochemistry, 41, 860-868. 6. WHO. (2004). Guidelines for drinking water quality, Vol. 1, 3rd Ed., Geneva. 7. Watt, G.C.M., Britton, A., Gilmour, H.G., Moore, M.R., Murray,G.D., and Robertson, S.J.(2000). “Public health implications of new guidelines for lead in drinking water: A case study in an area with historically high water lead levels.” Food and Chemical Toxicology, 38, 73-79. 8. Nasrazadani, A., Tahmourespour, A., and Hoodaji, M. (2011). “Determination of bacteria resistance threshold to lead, zinc and cadmium in three Industrial wastewater samples.” Int. J. Environ Stud, 36(56), 25-27. 9. Ahluwalia, S., and Goyal, D. (2007). “Microbial and plant derived biomass for removal of heavy metals from wastewater.” Biores. Technol., 98, 2243-2257. 10. Ahemad, M., and Malik, A. (2011). “Bioaccumulation of heavy metals by zinc resistant bacteria isolated from agricultural soils irrigated with wastewater.” Bacteriol. J., 2, 12-21. 11. Brady, D., and Duncan, J.R. (1994). “Chemical and enzymatic extraction of heavy metal binding polymers from isolated cell walls of S. cerevisiae.” Biotechnol. Bioeng., 44, 297-302. 12. Veglio, F., Biolchini, F., and Gasparro, H.(1997). “Biosorption of toxic heavy metals: An equilibrium study using free cells of Arthrobacter sp.” Process Biochem., 32 (2), 99-105. 13. Ahemad, M., and Kirbert, M. (2013). “Recent trends in microbial biosorption of heavy metals: A review.” BMB, 1(1),19-26. 14. Naik, M. M., and Dubey, S.K. (2011). “Lead-enhanced siderophore production and alteration in cell morphology in a Pb-resistant Pseudomonas aeruginosa strain 4EA.” Current Microbiology, 62, 409-414. 15. Naik, M.M., Pandey, A., and Dubey, S.K. (2012). “Pseudomonas aeruginosa strain WI-1 from Mandovi Estuary possesses metallothionein to alleviate lead toxicity and promotes plant growth.” Ecotoxicology and Environmental Safety, 79,129-133. 16. Naik, M.M., Pandey, A., and Dubey, S.K. (2012). “Biological characterization of lead-enhanced exopolysaccharide produced by a lead resistant Enterobacter cloacae strain P2B.” Biodegradation, 23,775-783. 17. Ramaiah, D.J., and Vardayan, L. (2008). “Detoxification of toxic heavy metals by marine bacteria highly resistant to mercury.” Marine Biotechnology, 10, 471-477. 18. Chojnacka, K. (2010). “Biosorption and bioaccumulation–the prospects for practical applications” Environment International, 36, 299-307. 19. Naja, G. M., and Volesky, B. (2010). “Treatment of metal-bearing effluents: Removal and recovery.” Wang, L. K., Chen, J.P., Hung, Y.T., and Shammas, N.K., (Eds.) Handbook on heavy metals in the environment, Taylor and Franci and CRC Press, Boca Raton, FL. 20. Vijayaraghavan, K., and Yun, Y.S. (2008). “Bacterial biosorbents and biosorption.” Biotechnol.Avdan, 26, 266-291. 21. Martin-Gonzalez, A., and Diaz, S., Borniquel, S., Gallego, A., and Gutierrez, J.C. (2006). “Cytotoxicity and bioaccumulation of heavy metals by ciliated protozoa isolated from urban wastewater treatment plants.” Res. Microbiol., 157, 108-118. 22. deSiloniz, M-I., Balsalobre, L., Alba, C., Valderrama, M-J., and Peina do, J.M. (2002). “Feasibility of copper uptake by the yeast Pichia guilliermondii isolated from sewage sludge.” Res Microbiol., 153(3), 173-180. 23. Huang, F., Dang, Z., Guo, C.L., Lu, G.N., Gu, R.R., Liu, H.J., and Zhang, H. (2013). “Biosorption of Cd(II) by live and dead cells of Bacillus cereus RC-1 isolated from cadmium contaminated soil.” Colloid Surf. B, 117, 11-18. 24. Malik, A. (2004). “Metal bioremediation through growing cells.” Environ. Int., 30, 261-278. 25. Chojnacka, K. (2010). “Biosorption and bioaccumulation—the prospects for practical applications.” Environ. Int., 36, 299-307. 26. Ferda˘g, O., Atar, N., Yazıcıo˘glua, D., and Olgun, A. (2011). “Biosorption of lead from aqueous solutions by Bacillus strains possessing heavy-metal resistance.” Chemical Engineering Journal, 173, 422-428. 27. Halttunena, T., Salminen, S., and Tahvonen, R. (2007). “Rapid removal of lead and cadmium from water by specific lactic acid bacteria.” International Journal of Food Microbiology, 114, 30-35. 28. Azza, A., Zeid, A., Wesam, A., Salama, M., Ghada, A., and Fahd, A. (2009). “Biosorption of some heavy metal ions using bacterial species isolated from agriculture waste water drains in Egypt.” J. Appl Sci Res., 5(4), 372-383. 29. Ibrahimipour, Gh., Foladi, J., TaliDaliri, S., and Tafakori, V. (2005). “Screening and selection of the best lead absorbant bacteria.” J. Environ Sci., 7, 1-12. 31. Limcharoensuk, T., Sook Sawat, N., Sumarnrote, A., Awutpet, T., Kruatrachue, M., Pokethitiyook, P., and Auesukaree, C. (2015). “Bioaccumulation and biosorption of Cd and Zn by bacteria isolated from a zinc mine in Thailand.” Ecotoxicology and Environmental Safety, 122, 322-330. 32. Cappicino and James. (1992). Microbiology: A laboratory manual, The Benjamin Cummings publishinig company, INC.39. Bridge parkway Redwood City, California, 94065. 33. Pan, R.X., Liu, R. X., and Tang, H.X. (2007). “Surface reaction of Bacillus cereus biomass and its biosorption for lead and copper ions PAN Jian-hua, LIU.” Journal of Environmental Sciences, 19, 403-408. 34. Rajesh., M.V., Santhana Krishna Kumar, A., and Rajesh, N. (2014). “Biosorption of cadmium using a novel bacterium isolated from an electronic industry effluent.” Chemical Engineering Journal, 235(1), 176-185. 36. Rehman, A., Ashfaq, A., Muneer, B., and Shakoori, A. R. (2007). Resistance and biosorption of mercury by bacteria isolated from industrial effluents.” Pakistan Journal of Zoology, 39(3), 137-146. 37. Huang, F., Guo, C.L., Lu, G., Yi, X.Y., Zhu, L.D., and Dang, Z. (2014). “Bioaccumulation characterization of cadmium by growing Bacillus cereus RC-1 and its mechanism.” Chemosphere, 109, 134-142. 38. Hossain, S.M., and Anantharaman, N. (2006). “Studies on bacterial growth and lead biosoption using Bacillus subtilis.” Indian Journal of Chemical Technology, 13, 591-596. 39. Wang, H., McCarthney, A., Qiu, X., and Zhao, R. (2012). “Cd2+ impact on metabolic cells of Saccharomyces cerevisiae over an extended period and implications for bioremediation.” J. Geomicrobiol, 29, 199-205. 40. Silver, S., and Phung, L.T.(2005). “A bacterial view of the periodic table: Genes and proteins for toxic inorganic ions.” J. Ind. Microbiol. Biotechnol, 32, 587-605. 42. Chang, J.S., and Chen, C. (1998). “Quantitative analysis and equilibrium models of selective adsorption in multimetal systems using a bacterial biosorbent.” Sep. Sci. Technol., 33, 611-632. 44. Matyar, F., Kaya, A., and Dinc, S. (2008). “Antibacterial agents and heavy metal resistance in Gram-negative bacteria isolated from seawater, shrimp and sediment in Iskenderun Bay, Turkey.” Sci. Total Environ., 407, 279-285. 45. Rho, J., and Kim, J. (2002). “Heavy metal biosorption and its significance to metal tolerance of streptomycetes.” Journal of Microbiology, 40, 51-54.